Researchers have identified a new mineral in the oldest solar system solids from primitive meteorites. They've named it "rubinite" after Dr. Alan E. Rubin, a pioneering cosmochemist at University of California, Los Angeles. Rubinite was officially approved in March 2017 by the International Mineralogical Association. Calcium-aluminum-rich inclusions (CAIs) are the first solar system solids that formed at high temperatures in a region close to the protosun about 4.568 billion years ago. They occur as submillimeter- to centimeter-sized rocks in carbonaceous chondrites - meteorites derived from primitive asteroids. Because CAIs retain the properties of physico-chemical conditions of the early solar system, they are very valuable to the study of planetary science. CAIs from two different carbonaceous chondrites were studied independently by Takashi Yoshizaki from Tohoku University and Chi Ma of the California Institute of Technology. They found tiny (< 10 µm in diameter) grains of a new garnet mineral rubinite (chemical formula: Ca3Ti3+2Si3O12). In both cases, the new minerals show high Ti3+ contents, indicating that they formed under highly reducing conditions. 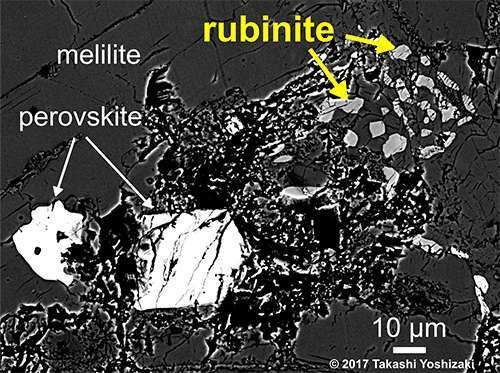 Further cosmochemical studies of rubinite will uncover new insights into nebular processes and evolution of the early solar system.